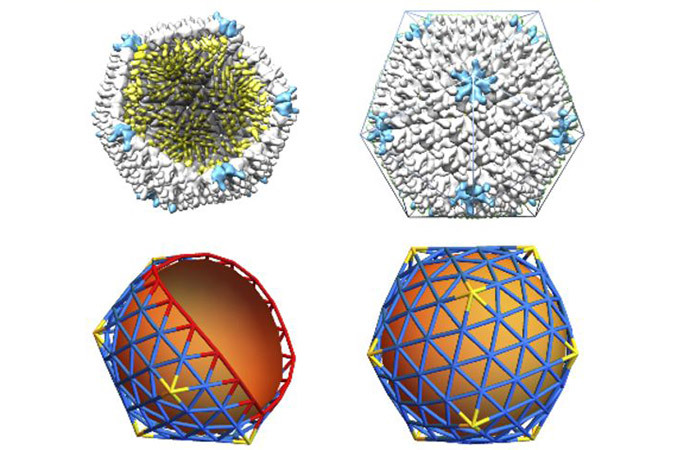 Penelitian - Researchers explains the underlying physical mechanisms for the formation of large viral shells and elucidates the “universal” role of scaffolding proteins in the formation of large spherical crystals. Despite a plethora of experimental data on the role of scaffolding proteins in the structure of viral shells, no theoretical/numerical explanations have been put forward to decipher the indisputable need of large shells for scaffolding proteins. More than 50 y ago, DL. Caspar and A. Klug made the striking observation that the capsids of most spherical viruses display icosahedral order (IO), defined by 12 five-coordinated units (disclinations or pentamers) occupying the vertices of an icosahedron surrounded by hexameric units. While many studies have shown that this universal IO is favored under mechanical equilibrium, the mechanism by which these shells grow, circumventing many possible activation barriers and leading to the perfect IO, remains mainly unknown. In the new report on the Proceeding of the National Academy of Sciences, Siyu Li of the University of California Riverside and team prove that as a spherical cap grows, there is a deep potential well at the locations of disclinations that later in the assembly process will become the vertices of an icosahedron. “Our results show that for large shells successful assembly into IO requires a nonspecific attractive interaction between protein subunits and a template. This interaction is implicit in the continuum model and is included as a generic attractive Lennard-Jones potential in the simulations,” said Li. Researchers introduce a minimal model and simulate the assembly of a viral shell around a template under nonequilibrium conditions and find a perfect match between the results of continuum elasticity theory and the numerical simulations. “Besides explaining available experimental results, the team provide a number of predictions. Implications for other problems in spherical crystals are also discussed. We find that the location of pentamers is completely controlled by the stretching energy as is the case in the continuum elasticity theory,” Li said.